For other uses of the name Hymen, see Hymen (disambiguation). 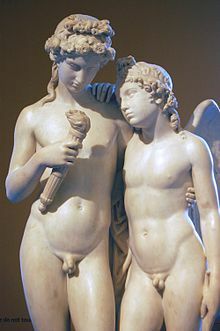 Cupid standing (left), and Hymen sitting (right). 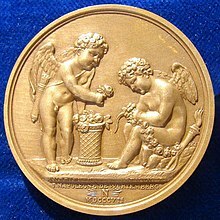 Hymen's burning torch on a Napoleonic wedding medal of 1807. It commemorates the marriage of Napoleon's youngest brother Jérôme Bonaparte to Princess Catharina of Württemberg at Fontainebleau. Hymen is supposed to attend every wedding. If he did not, then the marriage would supposedly prove disastrous, so the Greeks would run about calling his name aloud. He presided over many of the weddings in Greek mythology, for all the deities and their children. Hymen is celebrated in the ancient marriage song of unknown origin (called a Hymenaios) Hymen o Hymenae, Hymen delivered by G. Valerius Catullus. At least since the Italian Renaissance, Hymen was generally represented in art as a young man wearing a garland of flowers and holding a burning torch in one hand. Bring the light, uplift and show its flame! I am doing the god's service, see! I making his shrine to glow with tapers bright. O Hymen, king of marriage! blest is the bridegroom; blest am I also, the maiden soon to wed a princely lord in Argos. Hail Hymen, king of marriage! There is a song to Hymen in the comic opera H.M.S. Pinafore by W.S. Gilbert & A. Sullivan. Make it high, you builders! Like the War-god himself, the tallest of the tall! Hymen is the son of Dionysus/Bacchus (god of revelry) and Aphrodite (goddess of love); or, in some traditions, Apollo and one of the Muses. Other stories give Hymen a legendary origin. In one of the surviving fragments of the Megalai Ehoiai attributed to Hesiod, it's told that Magnes "had a son of remarkable beauty, Hymenaeus. And when Apollo saw the boy, he was seized with love for him, and wouldn't leave the house of Magnes". Aristophanes' Peace ends with Trygaeus and the Chorus singing the wedding song, with the repeated phrase "Oh Hymen! Oh Hymenaeus! ", a typical refrain for a wedding song. Hymen is also mentioned in chapter 20 of Vanity Fair by William Makepiece Thackeray. Hymen (1921) is an early book of poetry by the American modernist poet H.D. The eponymous long poem of the collection imagines an ancient Greek women's ritual for a bride. According to a later romance, Hymen was an Athenian youth of great beauty but low birth who fell in love with the daughter of one of the city's wealthiest women. Since he couldn't speak to her or court her, due to his social standing, he instead followed her wherever she went. Hymen disguised himself as a woman in order to join one of these processions, a religious rite at Eleusis where only women went. The assemblage was captured by pirates, Hymen included. He encouraged the women and plotted strategy with them, and together they killed their captors. He then agreed with the women to go back to Athens and win their freedom, if he were allowed to marry one of them. He thus succeeded in both the mission and the marriage, and his marriage was so happy that Athenians instituted festivals in his honour and he came to be associated with marriage. Hymen was killed by Nicaea. ^ William Makepeace Thackeray: Vanity Fair. London: Penguin, s. a.
Leonhard Schmitz, "HYMEN." A dictionary of Greek and Roman biography and mythology, William Smith, editor. (11.57). P. Maas, "Hymenaios" REF 9 (1916) pp. 130–34. Ovid. Medea and Metamorphoses, 12. This page was last edited on 1 March 2019, at 03:22 (UTC).